Not many people in the U.S. will know that Luc Besson’s lavish new scifi epic, Valérian and the City of a Thousand Planets, is actually yet another movie adaptation of a hit comic book. This is mainly because Valerian the comic was never a hit in the U.S., although it’s been one of Europe’s best-loved scifi series for nearly 50 years. Want to know more about the history behind the movie, and the universe it inhabits? Here’s everything you need to know about Valérian. Since it was created by legendary French comic writer Pierre Christin and his lifelong friend artist Jean-Claude Mézières in 1967, Valérian—which has gone through several name changes, from Valérian, Spatio-Temporal Agent, to Valérian and Laureline, to simply Valérian—has been one of the most popular Franco-Belgian comics in Europe. The epic-length series first got printed in the pages of Pilote, a prominent French comics magazine that also featured famous series like Asterix and Blueberry, and ran for 21 volumes before it finally came to an end in 2010. While attempts to bring the entire series to the U.S. have stalled and failed several times over the last 50 years, the series has made some noticeable influences in Western scifi. Although rarely acknowledged officially, it’s long been believed that the series had a major influence on the creation of Star Wars, and more pointedly, Luc Besson’s other scifi movie classic, Fifth Element, wears its Valérian influences proudly on its sleeve—but that’s because Mézières actually worked with Besson on the film, while begging him to also bring Valérian to life on the big screen. 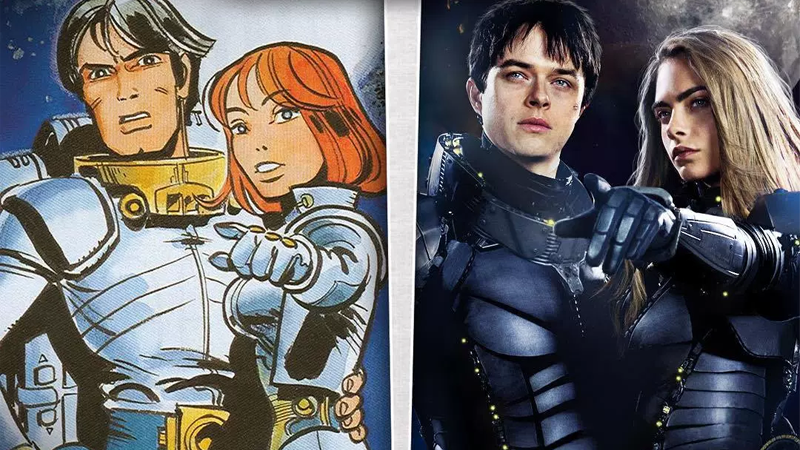 Pretty much since it started, Valérian has focused on its two protagonists: 28th-century human Valérian, an Earth-born agent of the Terran Empire’s Spatio-Temporal Service, and Laureline, a peasant from 11th century France who saves Valérian while he’s on a mission and is brought to the 28th Century to be trained as a spatio-temporal agent herself. That’s right: while it’s not exactly explicit in the first trailer, Valérian and Laureline are actually time travelers. Initially, they work for the Spatio-Temporal Service, going on secret missions through time and space to guard the timeline, but eventually, after the capital of the Terran Empire is mysteriously removed from time and space, they become freelance adventurers, offering their services in an attempt to find Valérian’s lost home. The movie seems to give Valérian and Laureline a flirtatious partnership, so we don’t get to really see much of the relationship that defined their partnerships in the comic; Laureline, removed from the context of growing up in the Terran Empire, was often the more rebellious of the two, questioning the authority of the Spatio-Temporal Service and their missions, while Valérian, the typical straight-edged hero, was usually loyal to a fault, leading to a few moments of headbutting between the partners in their earlier adventures. Alpha, the lavish setting of the movie seen throughout the trailer, isn’t actually a setting from the comics, but it appears to be based on Point Central, a recurring location throughout several volumes in the series. Like Alpha, Point Central is a “city of a thousand planets.” Well, more like a space station of a thousand planets. Built at a crossroad of intergalactic trade in the galaxy, Point Central is home to countless alien races, including representatives of humanity. Each different species that comes to Point Central eventually builds their own environment to attach to the station, tailored to their own biology and homeworld, creating a massive hub of different biospheres and environments. These alien races tend to stick to their own hub of Point Central in the comics, only communicating with other factions on the station through a central meeting area called the Hall of Screens to settle disagreements. Valérian and Laureline traveled to many different sections of Point Central over the course of their comics adventures, and the trailer might give us a few looks at some of the species that call the station home. And while we don’t see them in the trailer, we do know of another famous Valérian alien appearing in the movie: The Shingouz, a trio of information brokers from a race of sneaky spies. How Much Is the Movie Based on the Comics? It’d be impossible to adapt the entirety of Valérian to the big screen, but Besson has confirmed that the movie will loosely be based on the sixth volume of the comic, Ambassador of the Shadows, first released in 1975, and also the first volume of Valérian to be translated into English. That makes a lot of sense, given what we’ve seen in the trailer, and considering the action focuses a lot on the setting of Point Central, or “Alpha” as it is in the movie, which first appeared in Ambassadors of the Shadows. While the source material might not be that well known in the U.S. it’s clear from what we’ve seen of Besson’s movie, it’s borrowing quite a lot from Christin and Mézières’ iconic works. So when Valérian and the City of a Thousand Planet hits theaters next year—50 years after Valérian, Spatio-Temporal Agent first came to French magazine shelves—U.S. fans will finally be able to begin to explore one of Europe’s biggest scifi comics ever, and the galaxy of new adventures it contains.